Eyewitness reports say 250 men goaded and threw cans at police in the southern city. A man walks towards the teargas. AROUND 250 ENGLAND supporters pelted police with drink cans outside a bar in the southern French city of Marseille late last night ahead of the country’s opening Euro 2016 match. A 24-year-old Englishman was arrested and spent the night in custody after the trouble in the Vieux-Port area of the Mediterranean city. Police used teargas to disperse the England fans. England fans also clashed with another group, with one Englishman needing hospital treatment for a minor injury. A 30-year-old French man was also arrested after stealing an England football shirt. England face Russia in Marseille tomorrow in their opening match of the European Championships, which kick off in Paris on Friday when France play Romania. French and British authorities are determined to avoid a repeat of the scenes in Marseille during the 1998 World Cup when English hooligans clashed with Tunisia supporters. Email “French police set off teargas to disperse English hooligans in Marseille”. 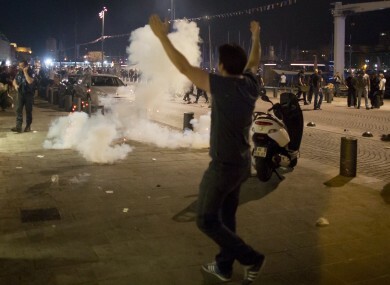 Feedback on “French police set off teargas to disperse English hooligans in Marseille”.